November is National Gratitude Month. This is the perfect time to teach your children this beneficial emotion. The gift of gratitude is a present you can give your children that will outlast the happiness brought by all their holiday toys. Having gratitude has been shown to block toxic emotions that may rise. People with higher gratitude levels have lower levels of stress and higher self-esteem. Studies done with children have resulted in better satisfaction with school and home. Children who show more gratitude also give more support to others and have better social support. Having more gratitude will help them in a big way, and will help them grow into caring, empathetic adults. Here are five ways you can foster the development of gratitude among your children this year. This is a great way for young and older children to focus on giving thanks. Teach them that whenever they receive a gift or a compliment, they should always say thank you. This starts with the parents. Remember that when your child does something that deserves some ‘thanks’, be generous with your gratitude. Model the behavior you would like them to have. 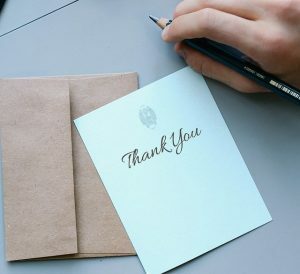 Teaching children to always say “thank you” will create an atmosphere of gratitude in the home. It will also turn into a lifelong practice. If at first, your children are forgetful to give their thanks, help them by having them restate their sentence with “thank you” included. Another habit to create is talking about gratitude with each other. Create a special time each day where everyone lists multiple things they are grateful for. This could be at dinner, during a car ride, or as a part of your children’s bedtime routine. Bonus points if this activity is done many times throughout the day. The question, “what are you thankful for?”, can serve as the high point of any conversation. It will also builds fond memories for your children. Find a jar that can hold multiple pieces of paper. Decorate it if you wish. Whenever your child wants to (they may need to be reminded) they can write on a piece of paper what they are grateful for. Before you know it, your jar will be full of small, sweet reminders of gratitude. Then, you can either pick a specific time to pull them out and read them together, or you can pick them out one at a time. Children thrive when they are around their parents. One way to foster your relationship is to spend more time with your children. When you spend an ample amount of quality time with them, you are teaching them the language of love. This results in both of you gaining more empathy. This is very important for building gratitude, as empathy is a crucial component of feeling thankful. So, put away your smartphone and turn off all other distractions. Savor the moments you have together. Spending quality time with your children will give them a better sense of appreciation. One of the best things you can do for your children is to assist them in finding their sense of purpose. It is an important parental duty to help our children discover what they are passionate about. Another way to foster this growth is to learn ways they can make a difference. When they discover this purpose, they will feel more connected to the world. This is great for fostering gratitude because the deepest sense of gratitude comes from finding our place and connecting to the bigger picture. This National Gratitude Month you can use these steps to encourage gratitude amongst your children, starting today. Pick a method of encouraging growth of their thankfulness, and stick to it for the whole month of November. By the end of the month, you will be able to see what a difference gratitude makes in your home. It is our responsibility as parents to teach our children to be grateful. This will help them with their stress levels. It will lessen toxic emotions and will help them with the relationships with others. Helping them to be more grateful will impact them throughout their entire lives.